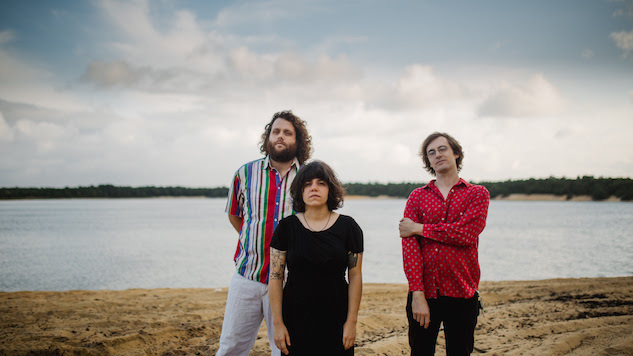 Marissa Paternoster’s vocals in Screaming Females’ “Deeply” are far from screaming. The track finds her in a state more vulnerable than normal, nestling her voice in a comfortable cloud of fuzz that hovers over a steady percussive march. The newest cut from the Females’ recently announced forthcoming album All At Once comes accompanied by a lyric video featuring Paternoster painting the lyrics on the exterior of The Black Sheep Cafe in Springfield, Ill. The rock powerhouses also announced a tour slated for next spring. After a triplet of release shows in Jersey City at the end of February, the band will embark on a North American run starting in March and continuing until the end of the next month. Throughout April, they’ll be joined by Thou and HIRS acting as support. All At Once, due out Feb. 23 via Don Giovanni, is the seventh record from the Females, following 2015’s Rose Mountain. “Deeply” is the third single from the album, coming after “Black Moon” and “Glass House.” See the lyric video for the track below, along with the band’s tour dates, and listen to Screaming Females’ 2013 Daytrotter Session, as well.